This is a Civil Defense Road Closure message for 6:40 p.m., Thursday, July 5, 2018. 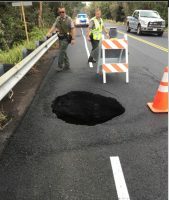 Hawaii Police Department reports that Highway 11 is restricted to one lane vicinity of the 30-mile marker near Volcano Country Club due to damage to the roadway. 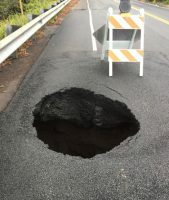 Motorists in the affected area are advised to drive with caution as State Highways and National Park personnel are on scene. Work to fill the 15′ X 20′ hole in the southbound lane will begin tomorrow (July 6). Avoid the area if possible, as alternate routes are not available at this time.